It appears as if there is continued misconceptions about what the rules and regulations are about electronic devices. According to this article, there have been numerous accounts of laptops being confiscated for days, officials perusing the history of website browsing on said laptops, cell phone call analysis, etc. I guess the lesson to be learned here is that if you are traveling (particularly out of the country) whether it be for personal vacation or on business you probably should investigate a way to backup critical data before going through customs. For instance, if they took all the electronic medium away and you had just finished a 10 day exotic fashion model shoot, you might be in a whole mess of trouble. This poses a bit of a conundrum, just how exactly are you going to backup tens of gigs of data? You could backup the data to an external hard drive that is in checked luggage or burn some DVD's, could be painfully slow depending on how much data you have. Maybe we will expand on some options in a future post...personally I do like the idea of the external hard drive and encrypt the whole darn thing as a deterrent. Although this picture looks more like "a touch of fall" it felt like spring with temperatures in the low 60's. This past Saturday we loaded up the family and decided to take a little hike around Kennesaw Mountain National Battlefield. This area is packed with history from the Civil War era. 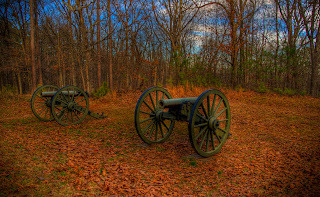 It was on Kennesaw Mountain that the confederate army made its last stand before the Union took Atlanta. If you have images on Flickr, you may be interested in this nifty neat front end to view them. Tiltviewer is web application that will call the Flickr API (application programming interface) and display your images. You will need to know your Flicker numeric userID (not username), in order to locate the userID you need to input your username on this page. You can use the application via their website for free, or you can purchase the application and put it on your own website. You can view my sample here. At one time or another most of us have tinkered with rechargeable batteries. In the past a lot of them were plagued with long charge times, memory issues in the battery where they may not have held their maximum amount of charge, and just plain expensive. Recently, I have been using rechargeables again, and am happy to say that they seem to be working quite well... You can do you part in the "Going Green" by using them and avoid having to dispose of those old alkalines. Not all batteries are created equal... It seems that the precharged batteries have a better life span and over the course of their life will hold more charge for a longer period of time. See the Duracell chart here. There is a review of AA Batteries here and AAA Batteries here. Again here is an area where not all things are created equal. There are quick chargers, portable chargers, chargers with analyzers and all in one chargers. This could be a subject in and of itself and maybe will be in a later posting, but I should say that initial research shows that the "quickest" charger is not necessarily the best charger. If you find an economical charger that has an analyzer built in, that would be a good choice. Another good alternative for location based photographers would be something like the Duracell portable charger that can plug into 110V as well as be powered by 12V cigarette light adapter and even has a USB port so you can charge USB devices (ipods, some cell phones, etc) as well. Most rechargeable batteries can re recharged 1000 times or more and therefore will assist to reduce the amount of tonnage that we put into landfills every year. Some reports say that there are in excess of 19,000 tons of batteries put thrown away every year. While I am certainly no recycling nut, the current batteries on the market coupled with some compelling charging options, it seems to make sense to give them a try. So, all you strobist fans, load up those speedlights with some new pre-charged NiMH batteries and give them a whirl.. So, about a week ago, the kids and I were walking the dog (point and shoot always with me) and as we entered the house, I saw what appeared to be a camera truck drive up the street... Knowing that they would soon return to making a circle around where I live we headed out to the corner and waited for him to drive by... When he saw that I was wearing a Google T-shirt, he stopped and chatted. While on business in San Francisco this week I arranged a photowalk for some fellow Googlers. A handful of us headed north on 101 to the bay area hitting the Sutro Baths a few minutes after sunset, and then onto the Golden Gate Bridge well after dark. During a recent business trip to the west coast, I was able to attend a seminar put on by David Hobby the creator of the strobist blog. 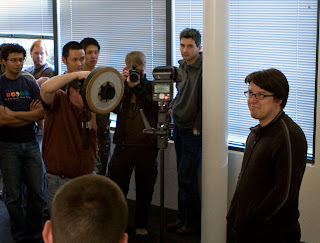 Here you can see David testing one of his latest gadgets, a do it yourself ring flash and demonstrating how it works to the class. and if you check the exif you should see that I have adhered to the "back to basics" post. Well the portfolio's are done, the voting is finished..... Congratulations to the 6 photographers/artists that were chosen to be part of Brian's new venture. The group of six was chosen by peer voting from a selection of 30 participating photographers from around the globe. Here is the link to the post from Brian over at Epic Edits with subsequent links to the finalists portfolios. If you have not seen the wonderful Lighting Mod article on creating your own black straw snoot, then you should check it out here. This is what I found. Amazing Goop! It is a contact adhesive like rubber cement and worked very well. If after searching your local favorite restaurants / liquor stores you still can't locate the black straws I got 700 of them from New York Bar Store for $6.95. Here is the part number NYB-PTY-04-STRAW-BLACK-700. I have a few hundred of them left, if you want some, I will drop 15 or so in the mail to you FREE OF CHARGE. Just be one of the first 15 people to shoot me an email.